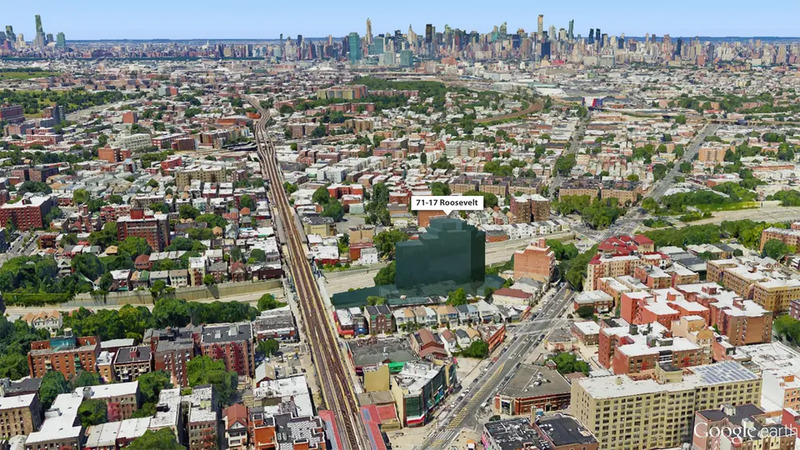 71-17 Roosevelt will be LIC-style "luxury rental"
New York YIMBY breaks the news that permits have been files for a new 15-story residential tower at 71-17 Roosevelt Avenue, next to the CSX tracks and currently the site of a church. It will include 139 apartments, and unfortunately, far too much parking for a site so close to transit. I guess this building would be the tallest high-rise in the vast area consisting of Astoria (some high rise buildings along the east river excluded), Sunnyside, Woodside, Jackson Heights, Elmhurst, East Elmhurst, Corona (Lefrak city buildings excluded). Considering the current tallest building in the neighbourhood is the Birchwood house (about 8-9 stories), and most other buildings are at most six stories. How does the zoning law work for this building? Are we expecting more high rise buildings in Jackson Heights/Woodside/Elmhurst, like what takes place in Long Island City, Astoria near the east river, or Flushing downtown? According to the zoning map, that area is zoned "R6," which allows residential buildings up to 13 stories. I am far from an expert on interpreting zoning regulations, but I think there are all sorts of exceptions that can be made to build larger such as including "community space," which I think includes "medical offices." R6 buildings are required to include a lot of off-street parking. Hopefully someone who understands the regulations better will interpret further, but it seems like there's very limited street-front access there for a building that size. Well, is it resident-only parking or public paid parking? Because if it's a paid parking lot, we REALLY need that. Have you stood at the corner of 37th and 73rd on a weekend night and looked at the plates? Jersey, Jersey, Jersey, Jersey, Connecticut. Those people aren't taking the train, they're gridlocking our neighborhood as they drive around slowly for 25 minutes looking for street spaces. it overlooks the BQE and prostitutes from many continents. that alone should sell it to wannabe frontiersmen. I only got a quick look from the 7 train, but it looked like the church has been taken down and they're ready to start construction on this. Is this project still going forward? While on 7 train yesterday, I saw construction started, which I believe is the address you mentioned, next to BQE. I found some new information and renderings on this project. Wow. The 7 train and BQE never looked so good. If I ever go on a dating site, I want these guys to do a rendering of me. and i didn't realize the 7 was just at ground level, and that far away from Roosevelt Ave. nice addition of old growth trees, too. 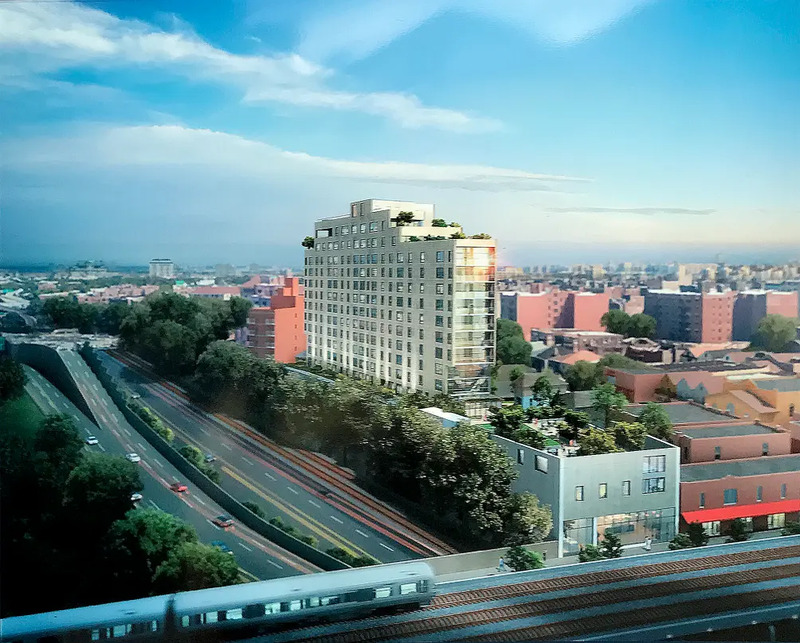 I'm pretty sure the parcel that's being called 71-17 Roosevelt Ave actually has only a short, small building with a green roof that abuts Roosevelt Ave. The 15 story tower (even though it is also 71-17 Roosevelt Ave) is set way back and more or less faces the BQE. At least that's my understanding from looking at the images. 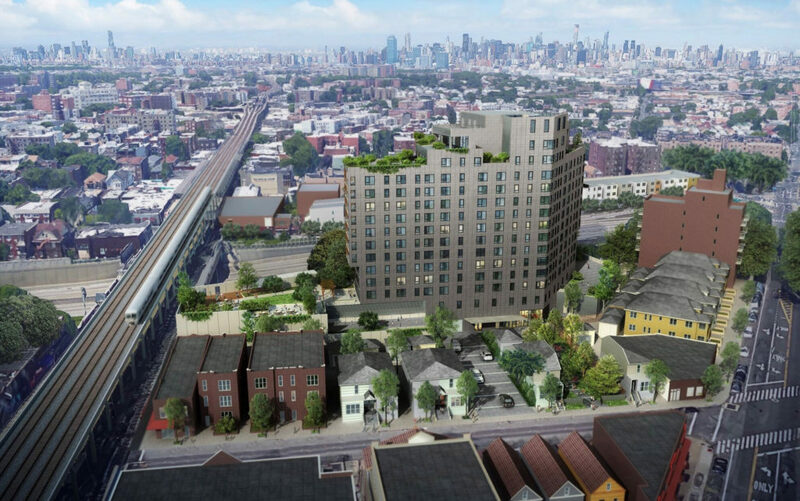 In the second rendering, the entire 71-17 Roosevelt Ave parcel appears in black. You can see that the left most section of the black shape sits next to Roosevelt and is quite small, and then the part that's on the right, not abutting Roosevelt, is the tall and large part of the project. It just looks so out of place.